things I have ever heard. It generates nothing but questions. What about the wild life. What about the ocean animals and plants. What about the air quality. How do you contain it. However, considering the effects they still suffer in Alaska and the lawsuits it does make a modicum of sense. I was a founding member of this group and their report marks the first time I have posted them I think. First we would like to express our condolences to the families who have lost loved ones on the rig and to the injured; our thoughts and prayers are with you. We at LEAN and Lower Mississippi Riverkeeper are bracing ourselves for what appears to be developing into an ecological tragedy. 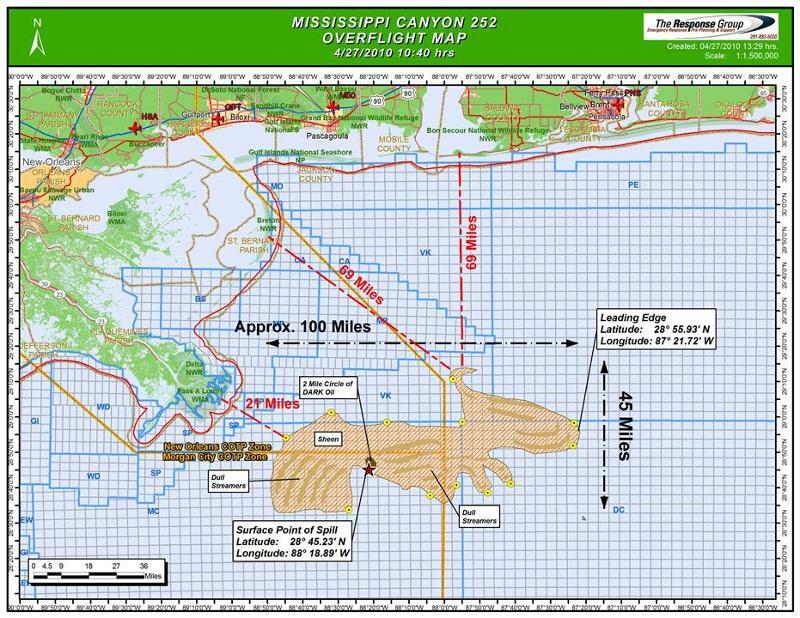 As of 10:40 a.m. the oil slick was just 21 miles South East of the mouth of the Mississippi River. Government agencies have been requesting oil booms to deploy around Delta National Wildlife Refuge (which already experienced a spill of 18,000 gallons of crude oil earlier this month). 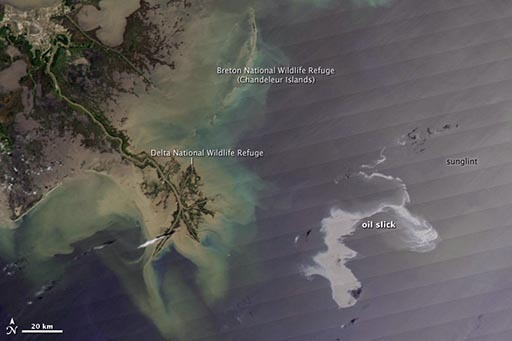 Delta National Wildlife Refuge is in the extreme south-eastern end of the Mississippi River Delta. Efforts to stop the flow using the blowout preventer have not been successful and oil continues to leak from at least two locations on the well pipe. What was originally considered “plan c,” the drilling of a relief well, currently appears to be the main plan to stop the leaking. Transocean’s drilling platform Development Driller III will be used to drill the relief well. It is hoped that the relief well will be able to bypass the leaking well and thereby stop the flow from the damaged well. However, it could take up to three months to drill the relief well and if some other method of shutting down the leaking well is not figured out in the meantime then it has been estimated that 100,000 barrels, or 4,200,000 gallons, of oil could be released into the Gulf before the relief well is operational. “If we don’t secure this well, this could be one of the most significant oil spills in U.S. history,” Coast Guard Rear Adm. Mary Landry said. Skimmer boats and the spraying of dispersant have been the primary means of dealing with the spilled oil so far but weather conditions are making things very difficult for responders. We understand that the responders will likely begin using control burning of the oil slicks if possible. If you encounter oil from this spill or to report oiled or injured wildlife you can contact the oil spill Unified Command at 1-800-557-1401. You can also contact us at 1-866-msriver. We will continue to monitor the situation and will keep everyone updated. We value the work that all of our partners are doing on this issue and we will continue to work with our partners throughout the Gulf region. Support this vital work today! Yes! I want to help make Louisiana safe for us and for future generations! LEAN is a 501(c)3 Non-Profit Organization Louisiana Environmental Action Network (LEAN) is a non-profit organization working to foster communication and cooperation among citizens and groups to address Louisiana’s environmental problems. This entry was posted in big oil, burning behavior, cool sites, dying planet, Energy Tough Love Blog, evil polluters, garbage, industry apologists, lies told by energy companies, pollution, portugal, smoke, spirituality, vampires, waste, water pollution by DougNic. Bookmark the permalink.